Wendy Klein admires the craft with which John Mole makes poetry out of the deepest of feelings. ambiguously happy to be back. I send you the jewel of a cormorant’s eye. Poem by poem, loss creeps into the text, linked to music and to art. In ‘A Kind of Blue’ the poet, knocking on the door of his own house, remembers Miles Davis in Paris, knowing the number of his room, but not the hotel. That note of uncertainty snaking through the text. of loss accepted and the gift of grace. The two sections of the book that follow – ‘Frailties’ and ‘Circumstance’ – are focused primarily on the processes of illness, recovery, and hope, the retrieval of what can be retrieved. In ‘How all Occasions’ the poet evokes King Lear in the scene where Gloucester kisses his hand: It smells / Of mortality. That line-break stops the reader’s breath, as poet and reader are plunged into memory in ‘…a subterranean / Gents,’ where the poet observes his hands under the air dryer as ‘A septuagenarian blur / of ripple and flap’. The last section of this rich and powerful collection, ‘Circumstances’, is dedicated to the poet’s deceased wife, Mary. It is made up of a deeply touching sequence of 19 poems, cataloguing her illness and death. They include moving scenes from his own tender care for her, reflections on their life together over time and, finally, a facing of that combination of utter loneliness and hope for eventual recovery which follows intense and tragic loss. With exquisite imagery the poet maintains a formality of presentation as if to contain the depth of feeling, to keep it from spilling out into naked emotion. In ‘Hang on’, wisteria leaves cling to the branch although ‘No doubt they will succumb / To frost or weariness, / shedding their burden…’ In the final poem ‘Thaw’, a delicate metaphor, the thought of the beloved ‘Is lamplight on a dark field, every grass blade /warming to your touch as memories…’ This poem confirms my core belief that it is not just the spilling out of our innermost feelings, the catharsis, that is important, but rather the crafting of those feelings into art. 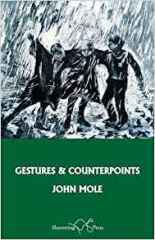 This is what John Mole does in this collection, a glowing achievement, following on from a lifetime’s work of huge variation and skill. I cannot recommend it too highly.